Facebook says up to 87 million people may have had their personal details transferred to Cambridge Analytica, a voter-profiling company that denies the data powered digital ad targeting for President Donald Trump’s 2016 campaign. The company plans to begin notifying those whose information may have been improperly shared starting on Monday, as well as clearer information about what apps are connected to a person’s account. 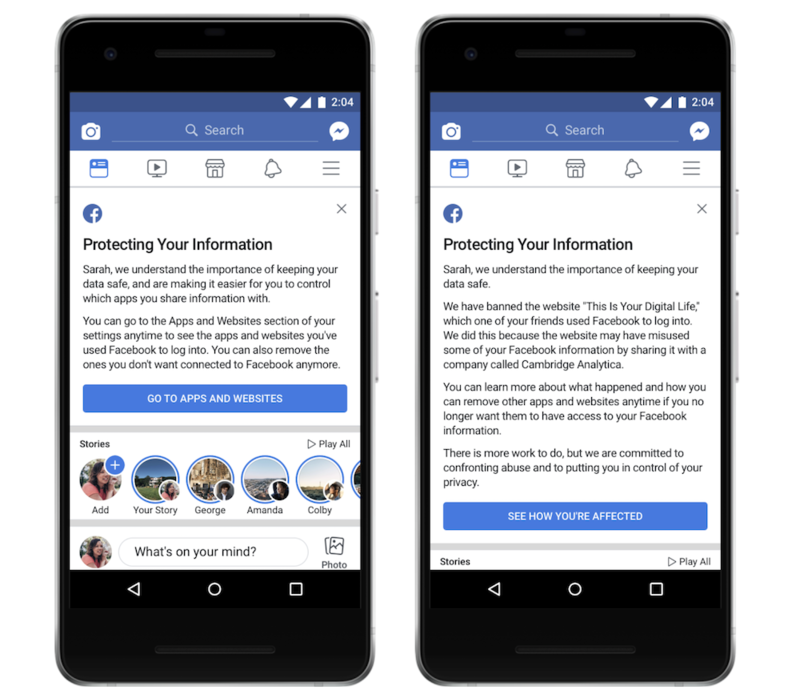 Starting Monday, Facebook will notify users of apps connected to their account (left) and if their data may have been exposed to Cambridge Analytica (right). 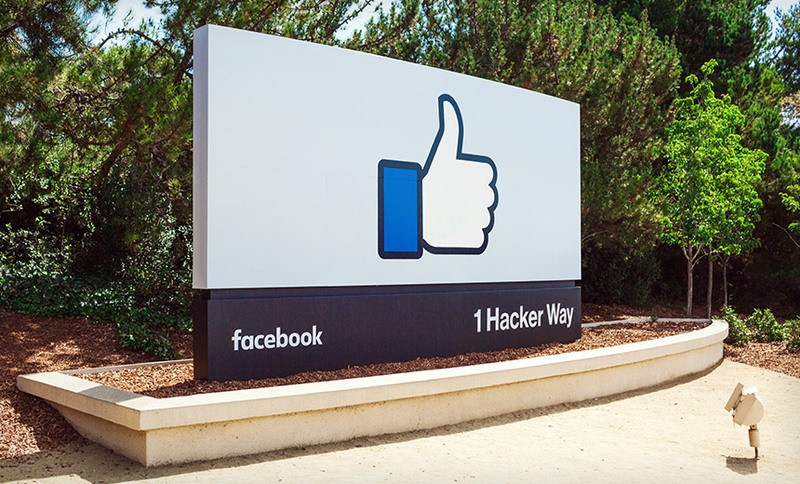 Facebook’s Chief Technology Officer Mike Schroepfer relayed the figure at the end of the blog post that outlined nine new data-sharing restrictions. Since the Cambridge Analytica scandal took hold, the company has scrambled to revise privacy settings to reassure users and fend off regulators. Facebook’s founder and CEO, Mark Zuckerberg, has taken a chief role in trying to tamp down anger towards the social network. Previous privacy controversies have tended to quickly fade, but this one has endured because of Cambridge Analytica’s work with the Trump campaign. But the company, which is owned by British military contractor SCL Group, denies that it used the Facebook user data for its Trump work. In a statement Wednesday, Cambridge Analytica disputed Facebook’s figure, saying it only acquired data for 30 million users. The app purported to be a personality survey, and it was used by around 270,000 people. At the time, Facebook allowed apps to collect personal information not only from direct users of the app but also their friends without consent unless those people had a specific privacy setting enabled. That greatly expanded the reach of Kogan’s app. Kogan sold the data to Cambridge Analytica, which was in violation of Facebook’s rules. Facebook had known about the situation since 2015, but only last month banned Kogan and Cambridge Analytica. Facebook arrived at the 87 million figure by looking at who actually used This Is Your Digital Life and then counting all of those users’ friends. However, the exposes in the Observer and The New York Times reported some of the raw data still exists. That sparked further enquiries from Facebook, and the U.K. Information Commissioner’s Office executed a search warrant at Cambridge Analytica’s offices. Privacy advocates have long alleged Facebook allowed too much access to personal data. In 2007, Facebook launched its Platform, a wildly successful program that allowed app developers to tap deep into peoples’ online activity. It also grew an immensely profitable targeted online advertising business. But it’s that permissive data sharing that Facebook says it will now pull back from. Many of the changes will restrict access to user data by apps with an eye to ensuring that users are aware and consent. For example, Schroepher writes that as of Wednesday Facebook is changing developers’ access to the Events API. When someone granted permission to an app to look at an events page, the app could also collect the full guest list of the event as well as comments on the particular page. Schroepher also writes that Facebook is making changes as a result of large-scale scraping of people’s public profiles. Facebook’s search and account recovery feature allows searches for users based on a phone number or email address. The feature has been embraced by countries where people have longer names, such as in Bangladesh, saving people from having to type full names. But Schroepher writes that “malicious actors” have been scraping public Facebook data using phone numbers and email addresses they already possess.